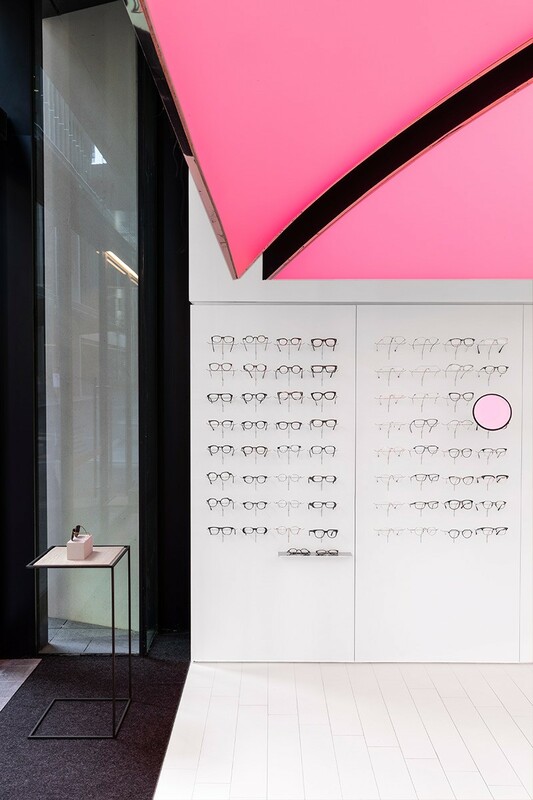 Light and colour are combined with crisp white surfaces to create an eye-catching store for Optique Barangaroo, designed by Smart Design Studio. Lighting and colour are powerful tools in retail, attracting customers’ attention, setting the mood of the store and complementing and highlighting the product. 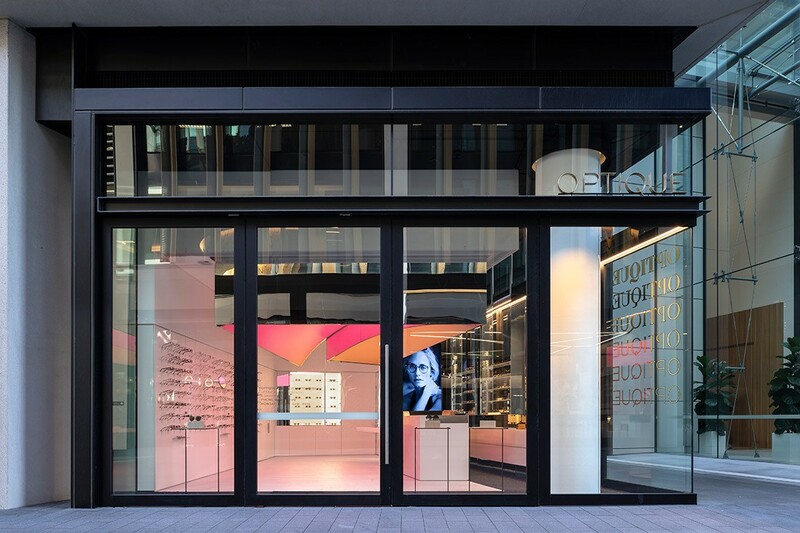 At Optique Barangaroo, Smart Design Studio (SDS) has combined light and colour with crisp white surfaces to create an eye-catching store for the optometrist and eyewear retailer. Optique Barangaroo follows on from Optique Double Bay and Optique Potts Point, designed by SDS in 2003 and 2012 respectively. 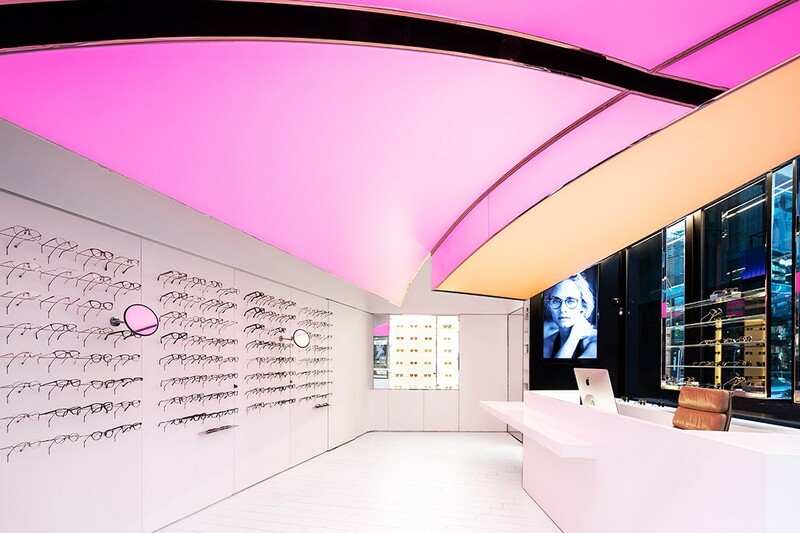 At Optique Potts Point, a “glittering showcase” with all-white floors and walls and multi-coloured mirrored ceiling is highly visible and inviting and to visually engage passersby. 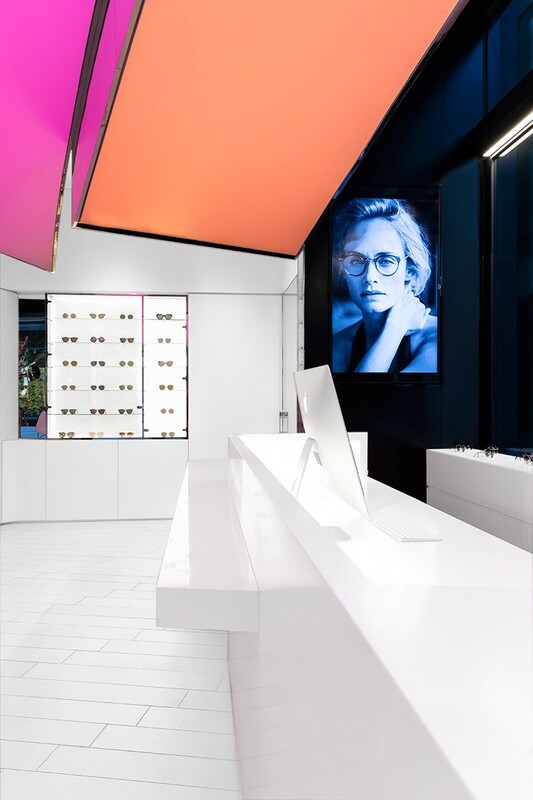 SDS used this same visual language at Optique Barangaroo to reinforce the brand and create a similar look and feel. 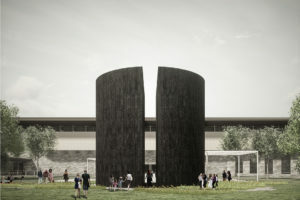 Located on a corner site, the store has street-facing windows on two sides, which enhances visibility into the store but limits display to two solid walls that also conceal back-of-house. The white walls, floors and counter provide a clean, bright backdrop, allowing the delicate optical frames and sunglasses to be the focus and contrasting with the strong black frames of the windows and architecture. The white walls, floors and counter provide a clean, bright backdrop, allowing the delicate optical frames and sunglasses to be the focus. Simple displays encourage customer interaction with the product, and white leather wall panels double as joinery with stock and cases stored behind. 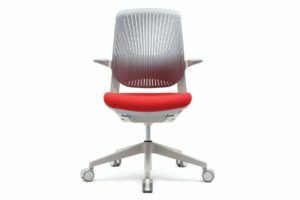 “This means the sales area is also the stock room, creating a retail space where the limited footprint is incredibly practical and efficient, and the customer is not left unattended,” says William Smart, founder of Smart Design Studio. A sleek white Corian counter is positioned in front of the window with a form that relates to the ceiling. The ceiling brings colour and sculpture to the space to attract passers-by. 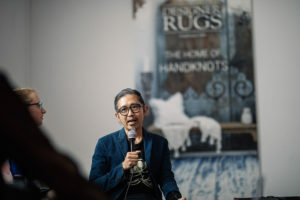 “The merchandise on display is small in scale so the space required a big gesture to grab the attention of foot traffic and address the urban scale,” William says. The stretched Barrisol ceiling has a softly arcing form with articulated illuminated light boxes. 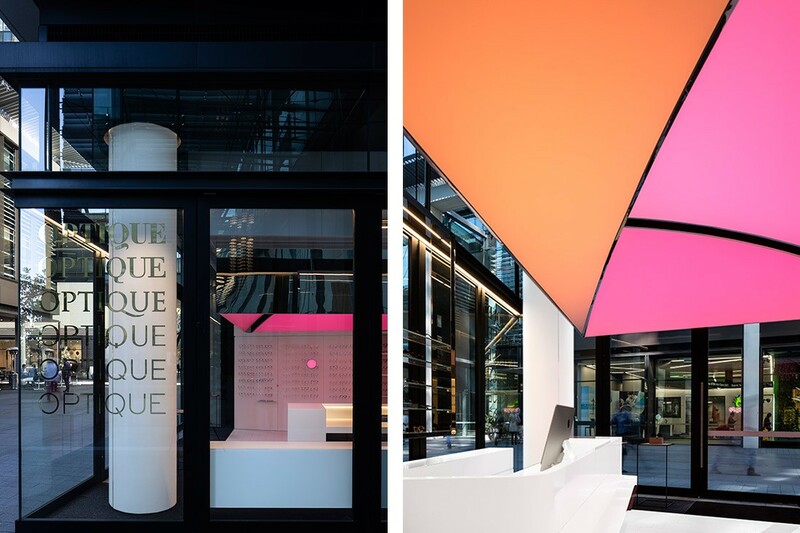 “Colourful mirrored boxes bounced light around the Double Bay and Potts Point spaces, whereas light emanates from the ceiling at Barangaroo,” William explains. The ceiling is back-lit with LED lights that can be adjusted to add warmth or drama. 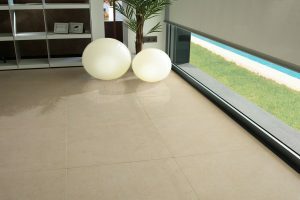 By day, the product and customers are bathed in soft complementary light. 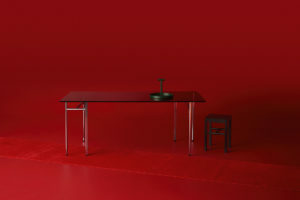 By night, a more dramatic colour combination is created to draw attention. “The effect is captivating and conceptually references what eyewear does: to tint, alter or enhance the image,” William says. 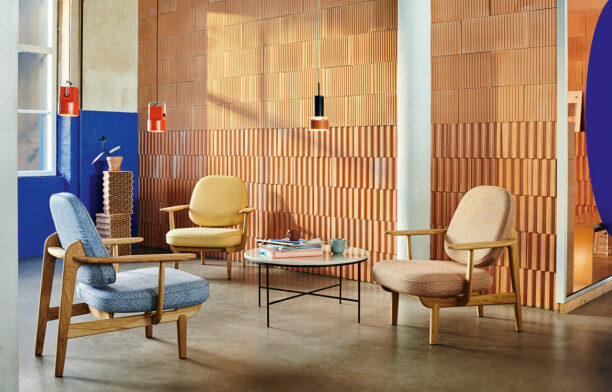 Get inspired every week, sign up for our newsletter.